Of this past decade’s alt-country songwriters, Deer Tick’s John McCauley has long been considered at the bottom of the ladder. Compared to the eloquent Dawes, or the experimental Blitzen Trapper, Dawes came out as the most… boozy. Their “beer-soaked rock n’ roll” lacked the musical and lyrical subtleties of their contemporaries. 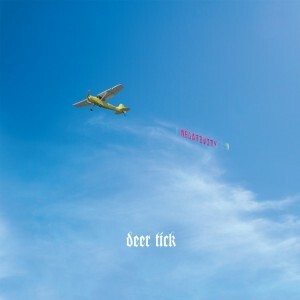 With Negativity, Deer Tick’s fifth album, the Rhode Island band does a fine job of turning that image around. Despite the gloomy title and dire subject matter, influenced by McCauley’s split with his fiancé and his father’s prison sentence, the record as a whole comes off determined and optimistic. Take the opening song, “The Rock,” about being in love with and then having your heart broken by an artist. It begins slow, deliberate, and even downtrodden, but there’s a tempo jump and a horn section that indicate no intention of giving up. McCauley’s scratchy voice finds some real power here, and the conviction in his delivery carries through the next few songs. These are a glorious set with a particularly standout performance in “Just Friends,” a beautiful Billy Joel sound-alike. A few songs don’t quite land, but they’re few and far between: “Mr. Sticks” falls into a generic category of lyricism; “Thyme” suffers from swampy overproduction; and “Pot Of Gold” is just a hot mess. Musicianship all around, however, has never been better. The poppy “The Dream’s In the Ditch,” notably written and sung by co-leader Ian O’Neil, discovers resilience in the face of hopelessness and stumbles upon a classical-and-jazz-fusing piano on its way. “Trash” exhibits McCauley’s soulful side, with funky blaring horns topped only by the delicious guitar solo, weaving in and out of those trumpets like it owns them. “In Our Time,” a country duet with pop singer Vanessa Carlton, and “Hey Doll,” an honest-to-God ballad, feel appropriately reflective. If McCauley and co. aren’t completely through the tunnel, Negativity certainly shows the hardest part of the journey is now behind them.